With Maruti Suzuki bringing in the new-generation Swift last year, and Hyundai updating the Grand i10 in 2017, the Ford Figo was showing its age – especially with regards to the features and equipment. With this face-lift, the American car maker has addressed the need and added some more changes that make the Figo a lot more relevant. In fact, unlike most face-lifts, this one also comes with a new powerplant – albeit just in the petrol trim. Here’s a look at how the refreshed Figo stands against its competitors. Just like before, Ford has the Figo on sale with three engine options – two petrol offerings and one diesel. Ford’s 1.2-litre petrol motor makes the maximum power and torque of the cars in the discussion. It develops 95bhp and 120Nm, both of which come marginally higher in the rev range than the Swift and the Grand i10. Ford’s 1.2 petrol only comes paired with a manual transmission. If you want something more powerful, Ford also offers the 121bhp 1.5-litre petrol motor in the Figo. This engine, however, is only on sale with a 6-speed automatic transmission. The Swift and the Grand i10 are on sale with just one petrol and one diesel engine. In the gasoline trim, both cars make more or less the same power and torque. Both these cars also get a 5-speed manual transmission. It’s the automatic variants that set the two apart – while the Swift gets a 5-speed AMT, the Grand i10 comes paired with a 4-speed AT. All three cars also come with a diesel engine option. Here too, the Figo is the most powerful of the lot – 99bhp and 215Nm from a 1.5-litre motor. The Swift and the Grand i10 although have different displacements make the same power and torque. Maruti Suzuki is the only car maker here to offer the option of a diesel AMT. As you can see from the table below, the Ford Figo is the longest car among the three by a considerable margin. In fact, at 2,490mm it even has the longest wheelbase. Interestingly, the Figo is not as wide as the Swift but 44mm wider than the Grand i10. Speaking of which, the Grand i10 is the smallest car here and even has the shortest wheelbase. Let’s start from the outside. The Figo is the only car among the lot to get front and rear fog lamps – the Swift and Grand i10 only get them at the front. While the Figo and the Grand i10 make do with conventional headlamps, the Swift gets am LED setup. Moving on to the inside, the Grand i10 gets dual-tone interior while the other two in question get a single-tone treatment. Some common features include electrically adjustable & retractable ORVMs, power windows, rear defogger, keyless entry, button start, reversing camera and more. The Ford does get rain-sensing wipers – something that is missing in both the other cars. All three cars get a touchscreen infotainment system but the Swift is the only come to be paired with a 6-speaker system. In terms of safety, the Figo gets as many as 6 airbags while the other two make do with 2 across all variants. ABS comes as standard in all the cars, but the Swift is the only one to get Brake Assist. Ford has priced the Figo extremely competitively. The base spec Figo starts at Rs 5.15 lakh while the top-end petrol variant goes up to Rs 8.09 lakh. The diesel, on the other hand, ranges from Rs 5.98 lakh to Rs 7.74 lakh. The Swift, on the other hand, starts at just Rs 4.99 lakh and goes right up to Rs 7.84 lakh for the top-spec petrol AMT. The top-spec diesel is priced at Rs 8.38 lakh for the manual transmission. The Grand i10 has the most affordable base trim at Rs 4.97 lakh. The fully loaded diesel trim is priced at Rs 7.62 lakh. 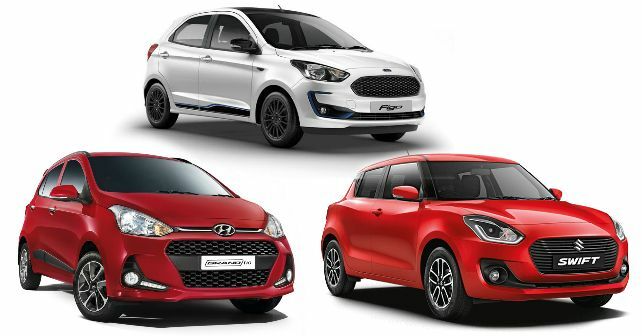 The Grand i10 is not only priced the cheapest but given that Hyundai is about to bring the refreshed model, Hyundai is currently offering all sorts of discounts and schemes to clear the existing stock. All prices ex-showroom Delhi.